Round bellows are available in sizes as small as ¾" ID x 2 ¼" OD up to 26" OD, and in lengths up to 20 feet or more. Materials are available to suit many environments. These bellows may be mounted to machinery using collar or flange end conditions sewn to customer's requirements. Typical applications include protection of screws, cylinder rods or guides. Options for round bellows include, zippers, sewn tabs, and stiffeners. Long, horizontal installations may require a bellows with grommets to minimize contact between the bellows and the item being covered. External grommets can be threaded onto a guidewire for additional support. Contact Joyce/Dayton with your requirements for this custom option. Hose clamps are used to attach round bellows with collars to machine structures. All round bellows with collar ends are provided with appropriately sized stainless steel hose clamps. Customers may specify the mounting hole pattern they need on the sewn fabric flange end of bellows. These mounting holes permit easy installation of bellows onto the customer’s machinery. If added mounting stiffness is required, customers may add as an option, steel back up flanges with coordinating hole patterns. Sewn tabs are recommended as an option on bellows with long travel lengths. These tabs limit the flexing of individual convolutions and thus stabilize long bellows. They also limit stress to the seams between convolutions. Experienced Customer Service Representatives can help you determine if these sewn tabs would be a benefit for your application. Steel back up flanges are sometimes used in addition to the flange ends of way covers and bellows. These steel flanges provide additional stiffness when mounting bellows and covers to machine elements. Customers may specify a mounting hole pattern to match that of the sewn fabric flange end on the bellows. Stiffener guides are plastic elements used to provide additional stiffness and support to non-vertical bellows. These plastic supports are designed to prevent the bellows from contacting the internal diameter or surface that the bellows protect. Stiffener guides for round bellows are typically mounted on the inside and may increase the closed dimension of the bellows. Non-circular stiffener guides are sometimes used to support long horizontal way covers. These guides are fitted between sewn convolutions. Vent holes placed in one or more sewn convolution allow the bellows to collapse more quickly in fast cycling applications. 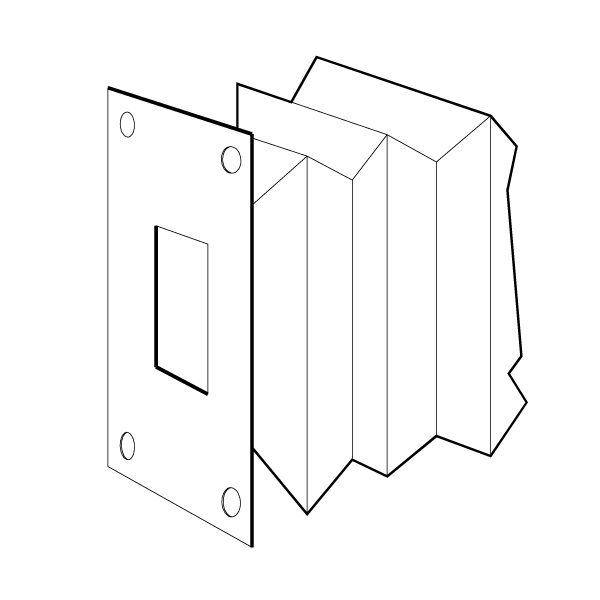 This simple addition to bellows permits air to escape or enter the bellows quickly. Zippered bellows make installation and replacement possible when machines cannot be disassembled. When these bellows are specified there is no need to detach the part that is being covered. Adding zippers to bellows increases the collapsed dimension compared to the non-zippered option. Typically, zippers are installed in a spiral to minimize this increase. Some material selections, like Teflon® coated fiberglass and Silicone coated fiberglass, exclude the possibility of zipper installation. Contact Joyce/Dayton with specific application requirements. (-51° C to 121° C) Resistant to moderate chemicals, acids, oils, fats, grease and many solvents. Good weathering and physical properties, flame retardant. Attacked by strong oxidizing acids, esters, ketones, chlorinated aromatic and nitro hydrocarbons. (-51° C to 149° C) Well suited for use in corrosive chemical environments. Offers additional resistance particularly against oxidizing agents like sulfuric acid, hypachlorites, high ozone, moderate chemicals, acids, oils, fats, grease and many solvents. Good weathering and physical properties, flame retardant. Attacked by concentrated oxidizing acids, esters, ketones, chlorinated aromatic and nitro hydrocarbons. (-73° C to 288° C) Excellent heat resistance and is not combustible. Will not rot or decay. Resistant to many solvents, weather and corrosive vapors. Has a 95% reflective heat property. Man-made material whose main constitute is silica sand. Begins to melt at 750° F.
(-73° C to 232° C) Resistant to moderate or oxidizing chemicals, ozone and concentrated sodium hydroxide. Attacked by many solvents, oils, concentrated acids and diluted sodium hydroxide. (-73° C to 260° C) Very good chemical inertness and resistance to a wide range of fluids. Only a few rare fluids will attack Teflon. Very stiff material that is not easily adapted for very small bellows. Request a Quote using our online Bellows Configurator. Simply click the “Request a Bellows Quote” button and choose the bellows shape, size and material. Tabs at the top of the page will guide you to select options, sizes and end conditions. A drawing will be instantly emailed to you and the quote will follow within 1 business day.